It's Valentine's Day weekend! Oh, boy, a day to celebrate love. What could be nicer? I'll tell you what could be nicer than celebrating love: actually feeling love. Knowing, down in the very core of your being, that you are loved. That's what could be nicer. There's a catch to that. To feel loved, you need to feel lovable. You need to know that you--the real you, the person in your body who lives and breathes and moves and does life, you--are loveable. If you're like me, that's not so easy. I'm a lucky woman. I've been married to my college sweetheart for over 30 years now. I have three wonderful children. But for most of my life, I've struggled with difficulty in feeling loved, in being secure in love. I've written a few times about my struggle to accept myself just as I am. I was born with an extremely rare disease called Klippel-Trenaunay Syndrome. It's so rare, in fact, that my parents could never find out exactly what was wrong with me. Only after I was an adult and had two children of my own did I learn the name of my disorder. All I knew was that I was deformed. I had the largest birthmark in the world, or so it seemed to me. My right foot, leg, hip, and trunk were covered in a massive port-wine stain. And to make it worse, that same part of my body was also enlarged and misshapen. My right thigh was 2 1/2 inches larger in circumference than my left thigh. Oh, how I hated going swimming. Not because I didn't like to swim, but because I had wear a swimsuit. When I wore long pants, no one could see my birthmark. But in shorts or a swimsuit, I felt like a freak. People can be cruel, even if they don't mean to be. I particularly remember one summer day when I was about 30 years old. 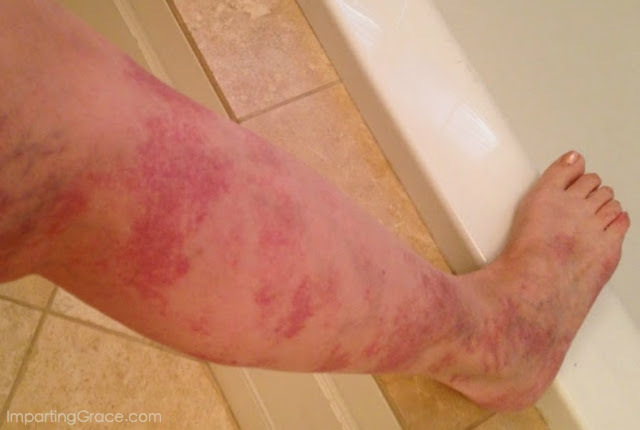 I was at the store, pushing my little ones in a cart, when a woman stopped me, pointed to my birthmark, and shrieked, "What is wrong with your leg?" You could have heard her voice two aisles over. Outwardly I kept my cool and politely answered her question. Inwardly I shrank into a tiny ball, humiliated. Years went by, and I never realized just how much I had internalized my insecurity about my appearance. After all, I had a husband and three children; life was good. I was able to have my birthmark treated with laser therapy, which lessened its intensity a bit, and I felt fairly comfortable in my own skin. And then I went through a difficult period in my life, a time when everything seemed to crash around me. Desperate, I sought help from a therapist. Patiently, kindly, she peeled back layer after layer of insecurity, finally landing on the fact that I just couldn't quite believe that anyone--not God, not my husband, not my family or friends--could really love me. Not really. Not when I was so imperfect. I knew that I loved them; I was certain of that. But that they loved me? No. I hoped they did, but I could never quite believe it. I had to learn that, even though I thought of myself as deformed and ultimately unlovable, that wasn't the truth about me. The truth of the matter was that the only person who didn't love me was me. And in that state of not loving myself, I was unable to fully enjoy the love of others. I didn't trust anyone's love for me, because I simply didn't believe it could be true. Here's what I've learned, what I am still learning: I am lovable. Not because I'm perfect, because I know I'm not. All it takes is a quick look in the mirror to remind me of my physical imperfection, and a quick look into my heart to remind me of my spiritual imperfection. Nevertheless, I can know that I am lovable because I am loved. God loves me. He's loved me since I was in my mother's womb, already deformed but not yet exposed to the world. He's never held my shortcomings against me, never withheld his love because of my imperfection. "We love because He first loved us," the Bible tells us (I John 4:19). Do you see? Not "we love because we're so full of goodness," or "we love because we're so overwhelmed with emotion," but "we love because He first loved us." While I doubted others' love for me, I was certain that I loved them. But I missed the fact that my ability to love came directly from God's love for me. I always believed in God. I trusted Jesus for my salvation. But I didn't fully believe His words; I didn't quite trust what He said about loving me. I felt unlovable, and I transferred my insecurity into disbelief. Still, He persisted. He kept loving me, kept blessing me, kept wanting me to understand that He, the Lord of all Creation, the King of Kings, declares me--me! the deformed one!--lovable. He sees every bit of me, every piece that I try to hide--and He finds me loveable. So I celebrate this Valentine's Day with joy because of this precious bit of knowledge: I really am loved. As I grow in this knowledge, I can let go of my insecurities, drop away my self-protection, stop berating myself. It's a hard lesson; it's taking me such a long time to learn. But disbelief never yet altered any facts, and the fact is that I am loved. And I'm here to tell you that you are loved, too. You are. Do you know? What a beautiful testimony! For every girl who has a blemish (visible or invisible), but knows it is there just the same - your story should definitely give them hope!!! We are loved by the most precious Savior - no.matter.what!!! ..and that is great news! Blessings to you and yours!!! Good afternoon. Thank you. Just thank you. That post is me. It is like you could see inside my heart and soul and you put into words all my feelings. I know all these things, just as you do, but to have someone put them into words, words that are so true, it makes me know, I am not alone. I feel like this too. I have a wonderful family that loves me, I have not doubts about that but when it comes to myself, I just can't. I will try just like you and I will continue to pray that I can feel better about myself. Thank you for this. I was having a hard day yesterday and wow this helped. Your post touch my heart today in a way that you will never know . Thank you . Ohhhh. You've made me weep with joy at the goodness of our Savior's love. And made me think about my own deformity in light of eternity. I am learning that in being "fearfully and wonderfully made" - God chose to craft me this way in order that his strength would be made known through my very weakness. Would I lean on him, cry out to him, or need his grace if I was more visibly "perfect?" He tailors each of us just so that we will need him. Thank you for a thoughtful post. 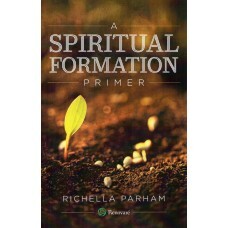 Richella, thank you for sharing your story and I'm so happy that you know you are loved by many. "Jesus loves us this I know. For the Bible tells me so". You are a beautiful person, hon. We are made overcomers by the words of our testimony, and what a beautiful testimony you have shared here. I remember reading this post before about your condition Richella...and I was so moved by what you wrote. You are an amazing women! You are precious, beautiful, loving, kind...and gifted. 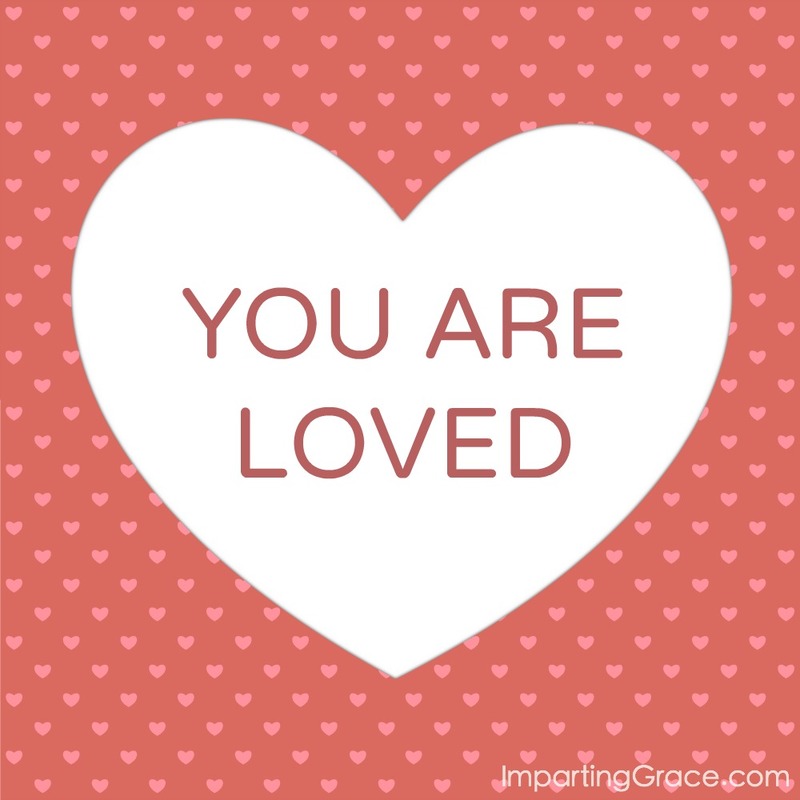 You are special and loved! I appreciate how you have so openly shared with others, so that they may find hope, and the beauty of God's love for them. As you share your testimony may God richly bless you sweetie. What a beautiful post from an even more beautiful woman. Blessings to you and your beautiful heart.